Happy Monday! How was your weekend? Ours was great and busy! We were on go all weekend. Between trying a new restaurant, catching the Blue Angels demonstration at the air show in town and taking some time to play outside, we stayed out in the sun quite a bit. Since we’re all fair-skinned, we don’t leave the house without sunscreen. In fact, I keep a small pouch of essentials that we always seem to need during the summer. Most importantly, our Neutrogena Sheer Zinc® SPF 30 Lotion and Neutrogena Sheer Zinc® SPF 50 Face Lotion is the first product to be tossed in the pouch when we head out the door. Neutrogena is the brand of sunscreen we trust. In fact, we love any and all of the Neutrogena sunscreens. This Sheer Zinc Lotion is perfect for us, because it offers superior UVA/UVB protection that’s gentle even on sensitive skin. The Purescreen® technology is powdered by naturally-resourced, 100% zinc oxide. Another thing that I love is that it’s sweat and water resistant and non-comedogenic, so it won’t clog your pores. 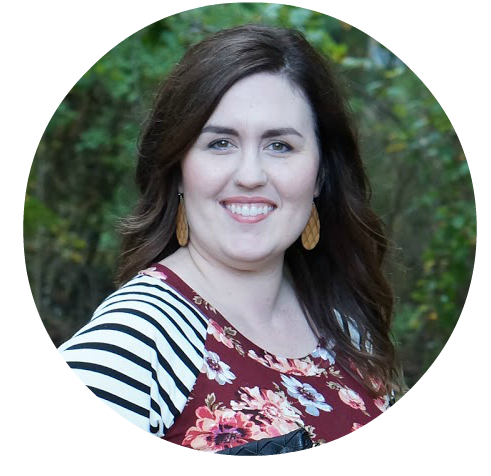 I thought it’d be fun to share the rest of my essentials in a ‘what’s-in-my-bag’ style of post! Aside from the obvious wallet and sunglasses, I have a super cute pouch that I picked up at Target while I was restocking our sunscreen stash. In fact, right now you can earn one $5 Target GiftCard when you spend $15 in sun care! I love Target deals!! This deal is good from 5/21 – 5/27. 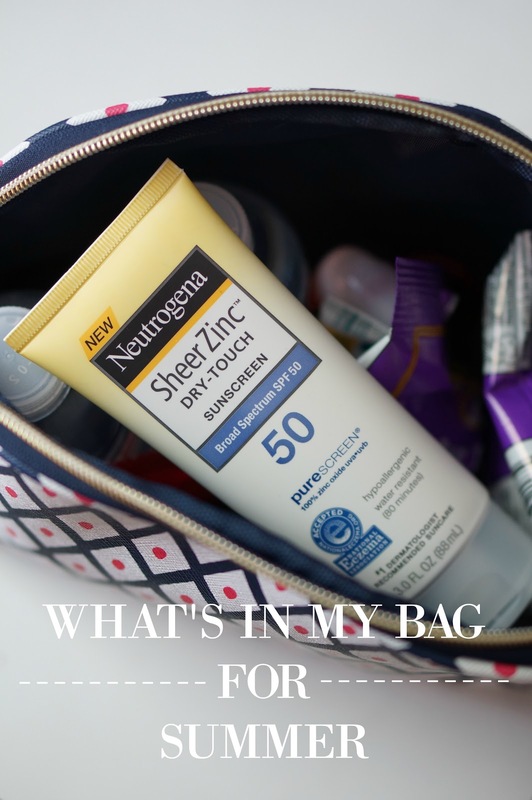 In my main pouch, I keep our Neutrogena Sheer Zinc SPF 30 Lotion. 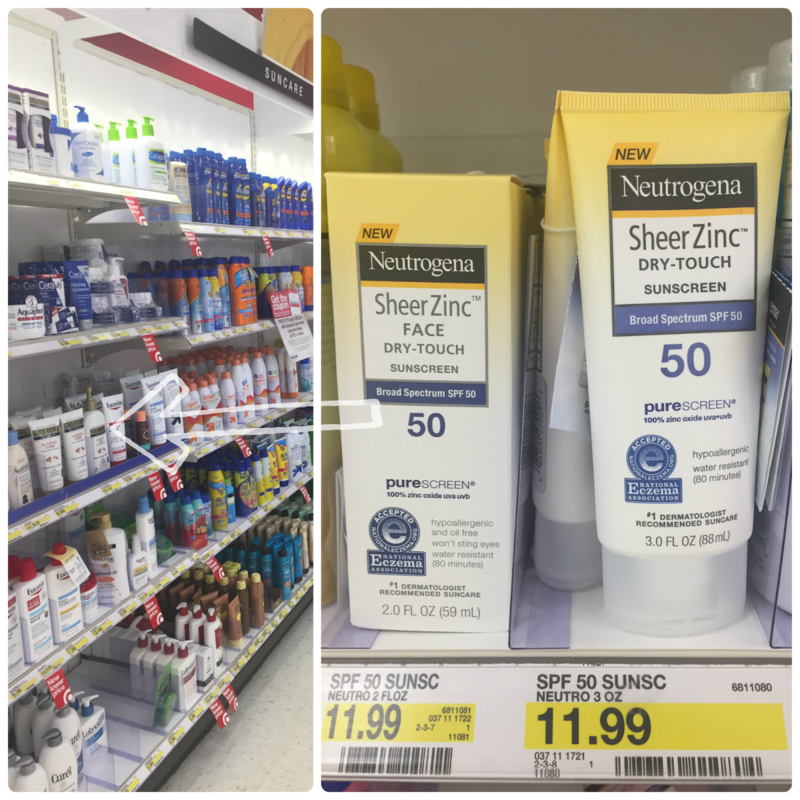 If we’re going to be outside for a long time, I will also throw in our Neutrogena Sheer Zinc SPF 30 Face Lotion. I also keep a few mini bottles of water, a few different snacks (some salty, some sweet), band-aids, antibiotic ointment, and hand sanitizer. I feel prepared for anything! Now that I’ve shared how we stay ready for anything during the summer, tell me how you keep your skin safe during the summer!